The gluteus maximus, or glute, is likely the most discussed muscle in the body, particularly in the world of athletics. As a performance coach, personal trainer, physical therapist or any other professional that works to understand the human body, this is likely one of the most fascinating muscles as it is also the most commonly dysfunctional muscle found in athletes. There have been many methods and techniques introduced to assist with dysfunctional glutes, ranging from hip bridge, to banded clamshell, and other exercises to increase the glute firing. Before these specific methods to maximize glute activation and function in dynamic movements, the basics of the glute muscles must be entirely understood. The glute muscles are primarily responsible for hip extension, which as we know is crucial for all athletic events and movements. However, this muscle is also responsible for concentric movements in other planes, including abduction and external rotation. That being said, the glute is also responsible for the important role of eccentrically decelerating the hip in the opposite movements (hip flexion, adduction, and external rotation), which are all mechanisms of ACL tears, FAI, and other issues athletes experience. As the glutes become inhibited, for whatever reason, the ability to control the hip and knee become greatly reduced. This leads to an increase in traumatic injury likelihood, which we as coaches must be working to prevent at all times. As the primary driver of the hip into extension and the critical deceleration of the body safely, the glutes, and surrounding musculature should fire in a specific pattern with every movement. Whether it is running, cutting, walking, throwing a football, shooting in lacrosse, etc., the glutes should be utilized as the primary driver in EVERY movement. In hip extension, the glute should be the first muscle to fire, followed by the hamstring and contralateral quadratus lumborum (QL), which is shown below in Figure 1. This should not be new information to those dealing with the human body and elite level performers on a regular basis. However, the fact of the matter is almost every athlete we have tested does not utilize this optimal pattern. Ultimately your glutes function by the “use it or lose it” mentality. Unfortunately, and amazingly, your body is so efficient, intelligent, and aware of its need for hip extension in movement that it will find other ways to complete this required hip action. Regardless of the reasoning, it is vital a coach is capable of creating optimal, functional firing patterns within the hip with the glute as the primary mover. This will reduce injury likelihood and also improve power output from an athlete. This article will provide, what we feel, a scientific, research based, layered system to “reset” your athletes per se into their appropriate, optimal hip extension firing pattern. These methods will be laid out in a pyramid fashion ranging from pure volume with correct coaching and cueing, isometric activation protocols, manual activation techniques, up to structural adjustment principles to ensure appropriate patterning. 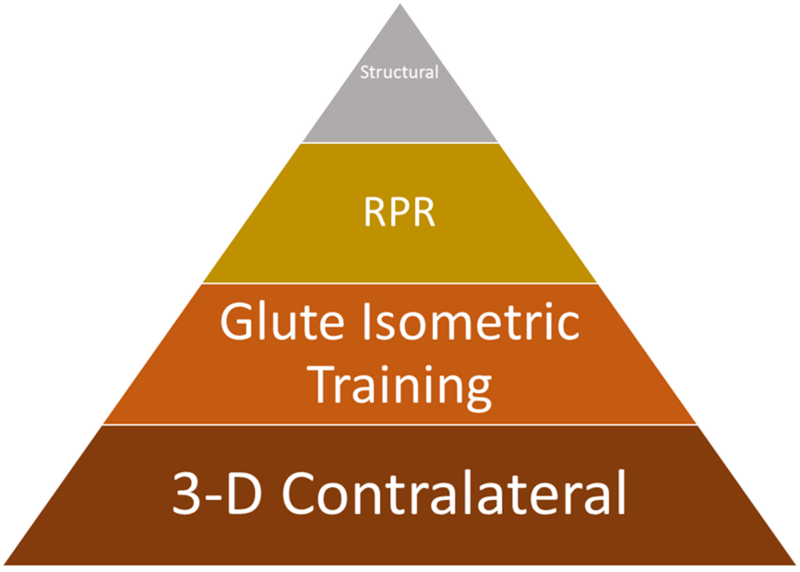 The glute layering pyramid, demonstrated below in Figure 2. This layered system begins with a foundation that all coaches should be capable of providing their athletes, and then progresses to other methods that become more selective in their utilization. At the very least coaches should be providing glute isometric work and then the 3-D contralateral circuit. Ultimately, this system is based on availability, with the most readily available systems forming the foundation of performance. After seeing this figure, some coaches may feel they already incorporate the majority of these. Which in all honesty is entirely possible that components of this protocol are implemented. However, as each layer is explained on a deeper level, every coach will begin to realize the physiological importance of the individual components involved in this glute training process. In order to ensure glute function to the highest extent, a coach must first ensure every athlete is in structural alignment. Many athletes have structural issues that may go unnoticed that are limiting performance. Without structural alignment, an athlete will become inhibited in specific muscle groups, particularly the glutes. If this structure is left in a misaligned position, the athlete will forever be in a reduced state of functioning. This returns to the concept of “don’t add load to dysfunction”. When the structural inhibitions of the body have been resolved, the Reflexive Performance Reset/RPRTM method is able to be implemented with the highest level of success. For those unfamiliar with this technique, it is a form of reflexive therapy that considers neurolymphatic, neurovascular, acupuncture, and many other techniques. When combined, this activation leads to an immediate change in muscle function and compensation patterns within every athlete. Through the utilization of the reflexive reset, RPRTM is applied to ensure the optimal hip firing pattern (glute, hamstring, and finally contralateral QL) of the body is functioning at the highest level. In movement, the muscles within the body do not function as individual pieces, but rather as entire chains. The synchronization realized due to the implementation of RPRTM allows the appropriate use of each muscle group within the kinetic chain at the correct time. A hyperlinked application of RPRTM on a daily basis in a warm-up is available only in the Triphasic Lacrosse Training Manual. Click here to gain access to this glute system. The glute isometric protocols are designed to regain the ability to fire the glutes in all three planes of motion. This training method has been developed due to evidence of increased corticomotor excitability through transcranial magnetic stimulation due to isometric glute training. Put simply, the motor cortex area of the brain specific to the glute muscle fires at a greater amplitude post-glute isometric training, or an athlete has an increased ability to learn to utilize their glutes in the appropriate firing pattern of hip extension after this training method is implemented. By priming the glutes through this readily available method, an athlete can then fire appropriately through a high volume of different exercises and movement planes to “cement” this optimal hip firing pattern. To view all five of the glute isometric levels in a hyperlinked fashion, along with the reasoning behind their progressions and their implementation within an annual cycle, click here. The 3-D contralateral program is completed after the glute isometric protocol as it adds repetition to the now available correct glute firing pattern in all three planes of motion. As referred to in the opening paragraphs, the glute has functions in all three planes of motion, only when these are incorporated into training appropriately can the highest level of function be achieved. Previous layers function to improve the ability to utilize the optimal hip extension pattern, however, they are all completed in an isolated fashion. The 3-D contralateral program is the first layer to utilize the appropriate glute firing pattern in full, complex, multi-planar movements. This is the most critical time for changes to be made in actual function through real-life, or athletic, movements. The glutes are clearly the most important muscle group in the human anatomy. They play a critical role in every aspect of locomotion as they function as the primary movers to extend the hips, particularly the eccentric deceleration of the body. When the glute activation process is set up in a layered system it allows coaches to emphasize certain aspects over others. In the layered example given here the foundation is formed by an activity that every coach should have prepared in their tool box, simply the ability to coach and cue an athlete. For that reason, the 3-D contralateral forms this foundation of optimal glute firing. Through high volume training of the glutes and good coaching the body will begin to utilize the glutes appropriately to a greater extent. To create a simple analogy for this glute layering process, we can treat the glutes like a circuit breaker. If an athlete’s structure, hip or foot function is off, it’s as if the power to the breaker is off. Regardless of how well the circuits function there is no change as there is no power input to the breaker. Once the power is on, or the athlete’s structure is appropriate, RPRTM methods can be applied to ensure the circuit to the glutes is closed, or able to conduct electricity. If this activation technique is not applied, an athlete will lack neural drive to the glutes, as a result the circuit will be left open, or be “switched off.” Once the circuit breaker has been closed or “flipped on” through RPR, the glute isometric training protocols are implemented to increase the strength and capacity of the “glute circuit.” Finally, the 3-D contralateral is implemented to repetitively send the stronger signal to the glutes, which increases the body’s ability to function at the highest possible level and begin to add strength appropriately. Every one of these layers within the functioning of the glute revealed in this section play a specific role. At the very least coaches must be capable of completing the basics prior to completing any others. Once again, when viewing the pyramid presented in Figure 2, a coach should begin from the highest level they are capable of completing all layers below. For example, if a coach is not trained in RPRTM techniques, the glute isometric and 3-D contralateral protocols would be implemented. A chiropractor that has been trained in RPRTM would be capable of utilizing all four methods of the layered glute protocol provided. 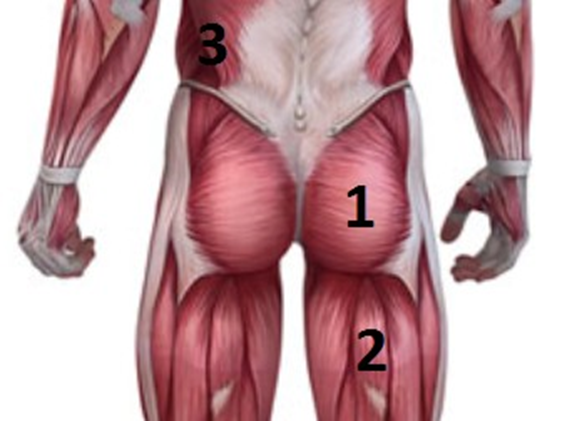 Only when each of these layers of the glute are considered and implemented appropriately will the glute regain its full function as a primary mover. Once this has been completed the body will utilize the appropriate, optimal pattern of glute, hamstring, and opposite QL, leading to vastly reduced injury likelihood and increased performance and power output. These layers described above in this model are only available in the Triphasic Lacrosse Training Manual. To gain access to the glute layering system, click here.